Each of us should focus on a healthy diet. Take medicine when you are sick, and the safety and hygiene in drug production is key. 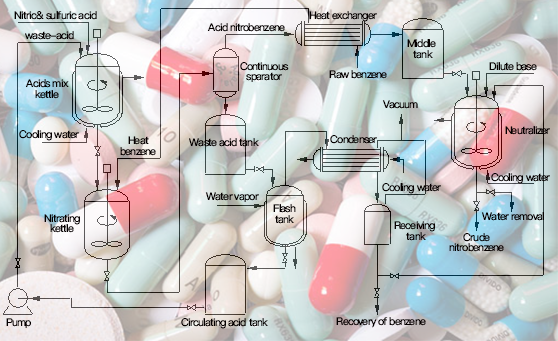 Hofmann Company provides you with important heat transfer and heat exchange solutions for pharmaceutical production to ensure the hygienic production of pharmaceuticals. Raw material, pretreatment, chemical reaction, separation, purification, product, preparation, and medicine. Mixed acid composition: HNO3 5%, H2SO4 68%, H2O 27%; the molar ratio of HNO3 in benzene to mixed acid is 1:1.1, and the reaction pressure is 0.46MPa; reaction temperature: 130 C; after the reaction, the nitrate enters the continuous separator and after separation the temperature of the acid nitrobenzene and the waste acid is about 120 C. The acidic nitrobenzene is sent to the refining section after cooling, alkali washing, water washing and the like. Mixing nitric acid and circulating acid in proportion to form a uniform mixture containing about 5% nitric acid and about 68% sulfuric acid. The mixed acid is pumped to the tubular reactor, and with benzene (about 10% excess of benzene to avoid the formation of dinitrobenzene and ensure high yield of nitrobenzene) is subjected to continuous nitration to form nitrobenzene, the residence time is about 12 minutes; The water produced by the nitration reaction dilutes the sulfuric acid from 68% to about 65%, and the heat generated by the reaction raises the reaction temperature from about 95 ° C to about 130 ° C.
The reaction mixture containing the organic matter and sulfuric acid from the reactor enters the gravity separator. The organics and spent sulfuric acid are separated here. The hot nitrobenzene containing a small amount of excess benzene and traces of sulfuric acid is heat-exchanged with the feed benzene and sent to the washing equipment for further processing. The spent sulfuric acid containing traces of organic matter and nitric acid is sent to a concentration process for disposal. The spent sulfuric acid from the nitrification process is flashed in the flasher, and some of the water is distilled off to concentrate the sulfuric acid concentration from 65% to 68%. The reaction heat absorbed by sulfuric acid during evaporation is self-evaporating, which accounts for about 85% of the heat required for flash vaporization, and the insufficient portion is supplied from the outside. The concentrated sulfuric acid is overflowed from the flasher into the storage tank, and then pumped to the nitrification process for recycling, and the lost small amount of sulfuric acid is supplemented here. The flashed gas is indirectly cooled by circulating cooling water. The gas containing traces of benzene, nitrobenzene and nitrogen oxides that has not been condensed is sucked out by a vacuum system and sent to an exhaust gas treatment unit. The condensed liquid flows to the separator where the organic phase is separated from the aqueous phase. The organic phase containing nitrobenzene and benzene is sent to a washing apparatus and the crude nitrobenzene to be further treated, and the aqueous phase containing traces of acid and organic matter is washed with crude nitrobenzene. The crude nitrobenzene is subjected to a three-stage neutralization countercurrent washing with the aqueous phase of the concentration step to remove dinitrobenzene and nitrophenol. After three stages of washing, the nitrobenzene is washed with water to neutrality. Neutral nitrobenzene is sent to the next step for purification. The two washing wastewaters are stripped of nitrobenzene by steam stripping, pyrolyzed and sent to a sewage treatment device, and the separated organic phase is returned to the washing process. Neutral crude nitrobenzene is preheated by preheater and sent to the distillation tower. After the material in the tower is heated by the reboiler, the benzene and water are distilled off from the top of the tower, and after being condensed by the condenser, the benzene water separator is separated and separated. The upper layer of benzene flows into the benzene storage tank, and the lower layer of water is removed from the trap after being treated by the wastewater tower. The refined nitrobenzene from the bottom of the column is exchanged with the crude nitrobenzene entering the tower, cooled by circulating cooling water, and collected in a storage tank. Condenser: Cooling with circulating cooling water. The medium is a gas from a flash tank containing benzene, nitrobenzene, nitrogen oxides, etc., and condensed into a liquid.